Chin strap held on the helmet by 4 rivets. Adjustable nylon straps with double adjustment (adjustment triangle for front/back lengths balanced or uneven), a fast self-locking buckle (dual-lock) and an anatomically designed pad. It can be moulded for a better adjustement. Fitted to the back band. The nape protector is anatomically designed. Fixed on the harness of the chin strap (not the helmet) to allow the ideal positioning of the helmet and ventilation of the back of the neck. 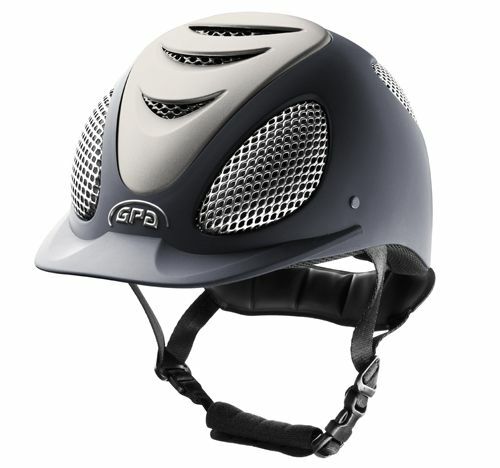 A cushion of thick foam padding covered by black PVC fabric with the GPA signature. 12 Sizes: from 52 to 63cm in 3 outer shell volumes. Ideal balance between the helmets inner volume and the volume of the outer shell which creates a perfect aesthetic harmony whatever the shape of the head.